Set your preferences for using PC WorkBreak. Click <Options> button on the main interface. Run it when PC boots - if you want PC WorkBreak runs automatically when Windows starts, please check it. Else, uncheck it. Default: Checked. Startup position - sets where do you want to place PC WorkBreak after it was opened, includes 'Normal' and 'System tray', default: 'Normal'. Delay for ? minutes when click <Delay> button - sets how many minutes you want to delay after clicked the <Delay> button on the Break interface, scope: 1~180, default: 5. The delayed breaks do not appear in the Statistics interface. 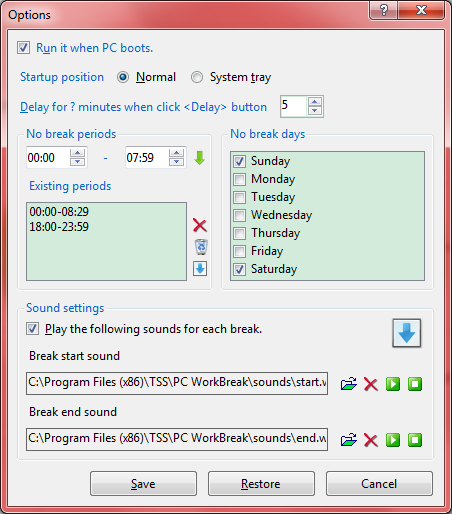 No break periods - in these periods, PC WorkBreak will not pop up the Break interface. Usually set them as the non working periods. No break days - in these days, PC WorkBreak will not pop up the Break interface. Usually set them as the non working days, such as Sat. and Sun. Sound settings - sets the sounds that you want to play at the start and end of each break. - adds the specified no break period to the existing periods list. - removes the selected no break period or the specified sound. - cleans up the no break periods list. - loads the predefined no break periods. - selects an audio file. - plays the specified sound. <Save> - saves your changes. <Restore> - restores the default settings. <Cancel> - cancels your changes and closes this dialog box <Esc>.